Like Gould’s The Mismeasure of Man, Tucker’s book debunks the application of “race science” to social problems and notions about the heritability of intelligence. Tucker’s accessible book focuses on the intrusion of these “scientists” into public and political life, the methodological problems with their research, and often the politics which underpinned their work. 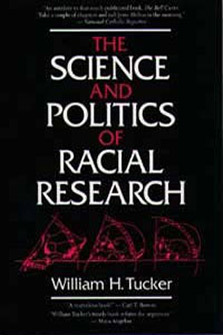 William H. Tucker is a professor of psychology at Rutgers University and the author of several books critical of race science. Tucker received his bachelor’s degree from Bates College in 1967, and his master’s and doctorate from Princeton University. He joined the faculty at Rutgers University in 1970 and has been there since. Tucker was a Psychometric Fellow for three years at Princeton, a position subsidized by Educational Testing Service. The majority of Tucker’s scholarship has been about psychometrics, not in it. He currently sits on the advisory board of the Institute for the Study of Academic Racism. He has written critical commentaries on several hereditarian psychologists known for their controversial work on race and intelligence. He has received awards for his research on Cyril Burt and the Pioneer Fund.